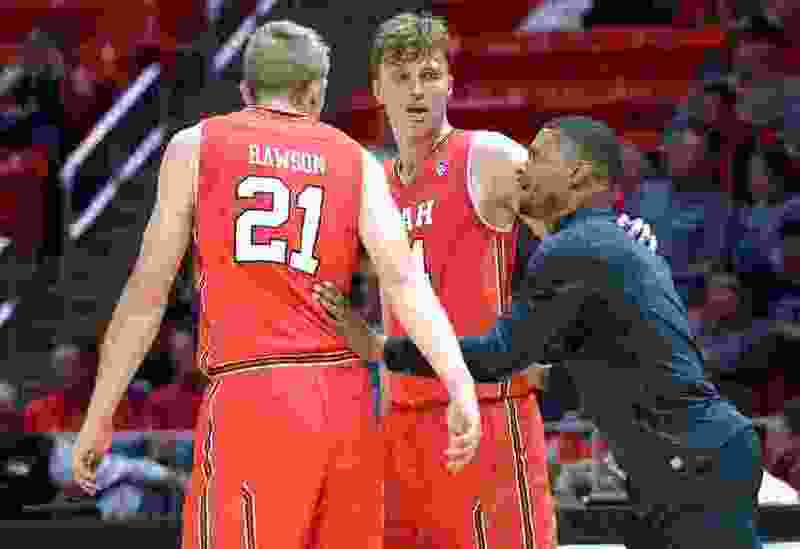 (Leah Hogsten | The Salt Lake Tribune) Utah Utes forward Tyler Rawson (21) and Utah Utes forward Jayce Johnson (34) are coached by assistant coach Demarlo Slocum during the Utah men's and women's basketball teams, Night with the Utes, Tuesday, Oct. 17, 2017, at the Jon M. Huntsman Center. Utah basketball coach Larry Krystkowiak may have a full-time coaching staff vacancy for the first time since taking the job and hiring his three assistants in 2011. DeMarlo Slocum is moving from Utah to UNLV as an assistant to newly hired coach T.J. Otzelberger, according to multiple reports. Slocum, 41, is a Las Vegas native and a former coach of an AAU team in his hometown. He spent four years on the Colorado State staff before coming to Utah. Slocum is known to have played an important role in the Utah program’s dynamic, acting as a bridge between the players and Krystkowiak. He also has been a key recruiter, involved in the Utes’ current pursuit of junior college guard Tazjel Sherman, who recently made an official visit to Utah. Sherman is scheduled to visit West Virginia this weekend and then make his decision among four finalists. Andy Hill and Tommy Connor remain from Krystkowiak’s original staff. Chris Jones became Utah’s director of basketball operations in 2016. In that role, according to NCAA rules, Jones is not allowed to have direct contact with players during practices or games. That would remain true even when his son, Rylan, joins the program this summer after graduating from Olympus High School.